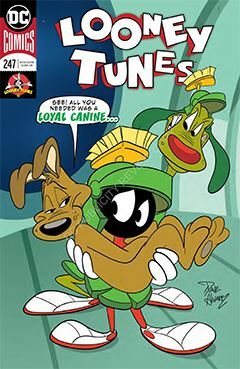 Three stories in a single issue, starting with “Home Planet,” featuring Marvin the Martian and Charlie Dog. Charlie usually bedevils the likes of Porky Pig or Elmer Fudd, trying to weasel his way into a pampered, domestic life. This time, he tries Marvin, who already has a dog. But K-9 is not about to be bamboozled out of his home. The two dogs do what comes natural: sniff each other’s butts (figuratively), then bark and chase one another until victory is declared. Hard to say who the winner is. Story #2 is a two-page theatrical feature starring Daffy Duck and Foghorn Leghorn. I must say I’m VERY disappointed, given that this same story ran only two issues ago. Which makes me think that Ye Editor(s) are getting a wee bit lazy – or desperate – to fill pages. Number two indeed. The Road Runner and Coyote round out the issue, with a tale long on sight gags and short on dialogue – much like the actual cartoons. Unfortunately, the slapstick doesn’t translate all that well to the printed page. It’s almost as if some took rejected storyboards and dropped them onto the page. Lots of sound effects too. I haven’t seen this much onomatopoeia since before Don Martin passed away. I usually enjoy all-ages books, but this title is so all-ages, it’s reminiscent of the Harvey comics of the 1960s. There is no price point on the cover, but anything over $1 is perhaps too much.